HSS: Common Eider, King Eider - Earth Liver C42 & Sense of Place CD/DVD/Book. Common Eider, King Eider - Earth Liver C42 & Sense of Place CD/DVD/Book. It has become rather apparent that only a handful of select people are listening to Common Eider, King Eider, and although I've given it a good deal of thought and had more than one conversation about it, I don't exactly understand why. The only thing I've been able to come up with is that perhaps people just don't get it, or perhaps they haven't been exposed to these wondrous sounds. The latter I can potentially do something about, but the former... well, that's another story. I'm not sure it's a good excuse, either. There's lots of music out there that no one, save perhaps the artist(s) themselves, really "gets." But being able to understand a work of music shouldn't preclude one from being able to enjoy it; frequently, I think, that's the point - if we stay away from trying to analyze and comprehend something on an intellectual level, and instead just focus on listening to the amazing sounds, we can get more out of it. And for those of us that are sometimes more intellectually inclined, a lack of understanding should motivate us to listen further. Especially when the music concerned is as special as that of Common Eider, King Eider. And this is very special music. It is unique in its musical approach, and emotionally stirring. 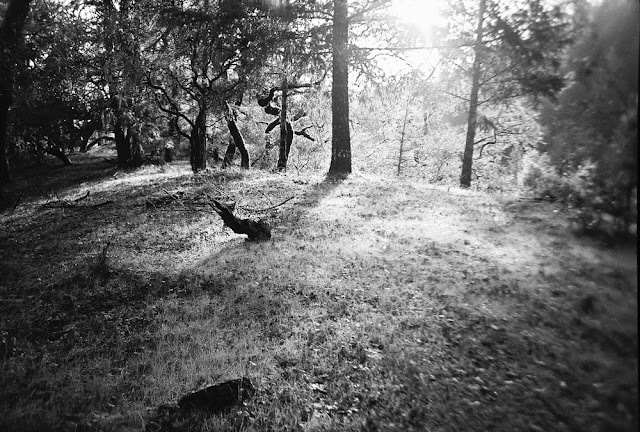 Utilizing elements of ambient, drone, folk, rock,and metal, the music focuses a simple array of instrumentation on communicating the unknown. Nature seems to be a recurring theme, to me at least. I don't just mean nature in terms of trees, animals, wilderness, and the things that the word "nature" typically conjures. I think it's safe to say that there's something deeper at work here. While that sense of the word "nature" does play a significant part, I think Common Eider, King Eider also explores human nature - the nature of our experiences and desires, the nature of human relationships, the nature of the limitations of human understanding, to name a few. The two latest releases from Common Eider, King Eider, are Earth Liver and Sense of Place. 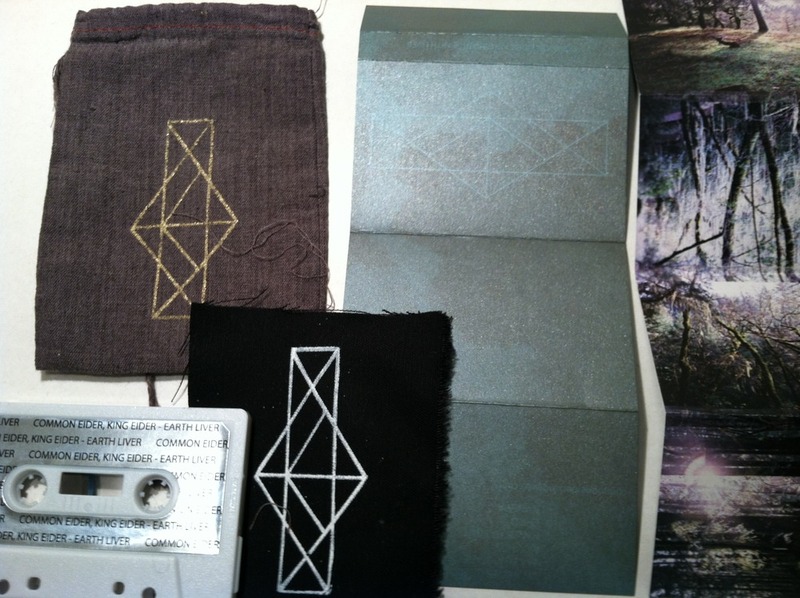 Earth Liver is a cassette release on the outstanding label Black Horizons. The C42 contains 4 new tracks, plus the track "Amnesia" from the one sided 12-inch of the same name. An extravagant package, the tape "comes packaged inside a hand-dyed gray and silkscreened-in-gold cloth bag. A patch of the logo in white ink on black fabric is included as well. The j-card is offset printed with green silver metallic ink on grey metallic cardstock for a truly smokey effect. There is also an insert with forest photos collaged, printed in full color on pearl metallic paper with abstract black printing on the reverse. Light gray tapes with silver labels." I have a copy of this and it really is quite beautiful. It's a limited edition, so it is recommended that you order it now while it is still available. You can get it from Black Horizons here, or from the artists themselves here. Sense of Place has apparently been in production for a long time, and its arrival is now imminent, with the official release date of July 19th nearly upon us. There are two "editions" - one with a CD, DVD (both intended to be played at the same time), and a 56 page full-color perfect-bound book of photos and minimal liner notes (which include a poem by Ben Chasny of Six Organs of Admittance), and one without the book, and I've personally got to think that the book is an invaluable part of the experience -this is an ambitious video/musical/print document of the band's quest to build a cabin in the wilds of Alaska. To purchase this, go to the band's bigcartel here, where you can also watch a short clip of the DVD. I think it's obvious that this should not be missed. Word is that San Francisco's Aquarius Records will have copies of this as well. To stream and/or download some more music from Common Eider, King Eider, you can go to their Bandcamp page and get busy. Like I said, this is pretty special music, and deserves to be treated as such. Everything you post here is an aural milestone, Mr. Kookie. Congrats for that.